We believe that humility is the greatest human virtue. We humbly recognize one another’s ideas to make the Health Lantern Experience the best experience for our customers. We aim to be honest to ourselves and to our customers. At Health Lantern we believe that being honest means that we do we what we say. We aim to achieve hundred percent customer satisfaction by focusing on quality. Quality is and always will be a key differentiator for Health Lantern. We ensure the highest standards of security and robust quality processes, which help us to drive productivity and efficiency. 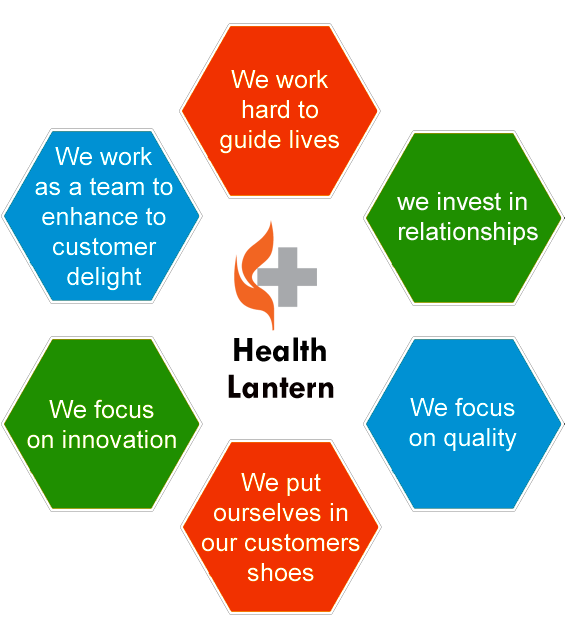 We believe that creativity is the greatest asset of a constantly developing organisation. We appreciate new ideas and put them into practice successfully sooner than others. We acknowledge innovation and strive hard to help our teammates in their holistic development. To enable customer to enjoy an enriched experience for medical help. To build a product which will further enhance the process of receiving medical aid. we aim to build products creating a world where lives move smooth feeling secure knowing that there is a company which is striving hard to guide people towards better living. To improve billion of lives by working hard to guide people towards better living. We assist in connecting lives with medical practitioners to simplify and enhance the overall experience of health care through the products build by us. Our vision is to create a society where no individual would be devoid of medical help, we are here to inculcate and educate people to understand that it is our basic right to enjoy healthy life. Our clear focus is on implementing and executing best quality solutions that we build for medical care practitioners. At Health Lantern there are certain set of theories that guide our actions. We call this the "Health Lantern Experience".